The Grand Central Hotel, summer of 2015. Photo by Cole Good. 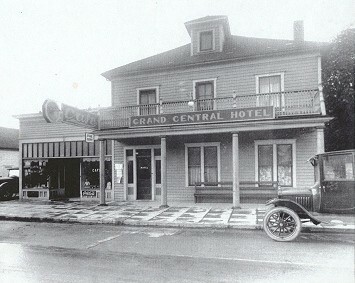 When the Grand Central Hotel was constructed, Issaquah was a stopover point for passengers traveling by train from Seattle to Snoqualmie. James Henry Croston, who worked in the mines as a carpenter, built the hotel in 1903 and operated it until his death in 1913. The family eventually sold the hotel in 1920. 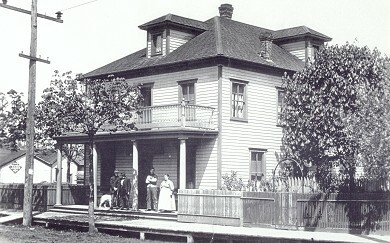 Early on, the hotel served as a temporary home to many of Issaquah’s future residents while they established their homes and businesses in town. Until recently, the building was in sad condition, particularly when compared to photos of its former grandeur. However, in 2003 a local contractor and resident of the Grand Central, Kurt Schlick, began doing restoration and repair work that transformed the building’s facade. 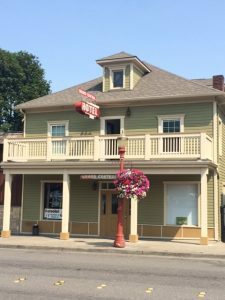 Issaquah is fortunate in that many of its remaining early buildings, such as the Railroad Depot, Pickering Barn, Oddfellows Hall, and Gilman Town Hall have been restored to good condition. The Grand Central, the last remaining of many hotels that served Issaquah early in the century, remains an excellent candidate for future restoration work. The adjacent Rolling Log Tavern has grown over the years, and now takes up part of the hotel building’s first floor. 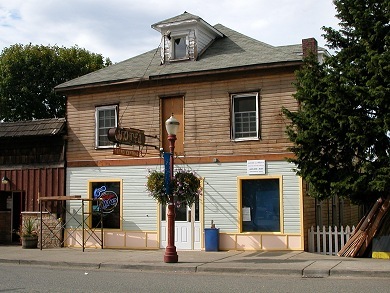 Originally a favorite hang-out of loggers in the 1930?s, the Rolling Log remains a favorite local pub. 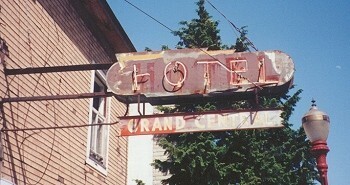 The Grand Central Hotel sign. May 1999 photo by David Bangs. 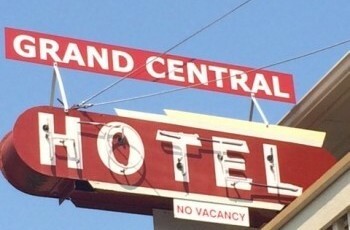 Restored Grand Central Hotel sign, summer 2015. Photo by Cole Good. This hotel is the last of many from Issaquah’s early years. It was built in 1903 as a three story rooming house by James Henry Croston, who operated it until his death in 1913. The Croston family sold the hotel in 1920, and the hotel has had many owners over the years. As of 1999, it is possible to rent a room, but the building is in deplorable condition. James Henry Croston moved from England to Pennsylvania in 1879, and then to Issaquah in 1893. He worked in the local mines as a carpenter. The Croston family boast some eight generations of carpenters! Denny Croston who operated the Issaquah-based Croston Construction Company still lives in Issaquah today. 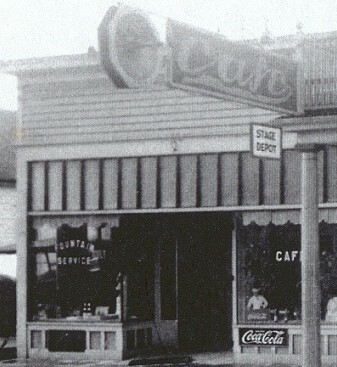 In the 1920s, the “Grand Central Cafe” was added to the west side of the building. 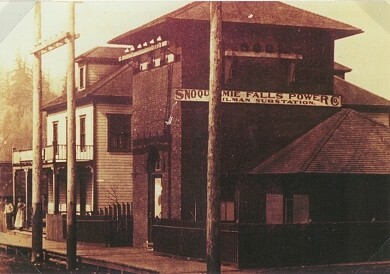 By 1940, the cafe had become the “Issaquah 10¢ Store.” At this time, the facade of the current “Rolling Log” tavern had been constructed to the west of the hotel, but the tavern had not yet been expanded to take over part of the hotel building. 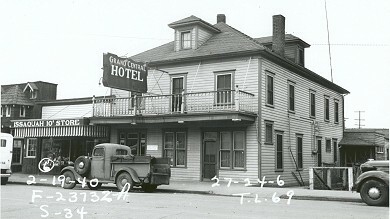 Walt Seil & his father, Edward “Nogs” Seil (lssaquah’s Marshall) bought the Grand Central Hotel in 1945. According to the Seils, Walt ran the place for about a year; his wife, Olga, did the housekeeping. Later in 1945 Walt Seil went on to work at what turned into a 30 year career at the creosote plant in West Seattle; his parents took over the running of the Grand Central Hotel. Walt & Olga Seil still live in Issaquah today. The Seils sold the hotel in 1962 to Art Burt, who sold it to John Lydon in 1994, along with the buildings housing the Rolling Log Tavern and the dry cleaning business behind the hotel. This ad appeared in the September 16, 1931 edition of The Issaquah Press. The Grand Central in the process of renovation. August 2004 photo by Jim Loring. This hotel, currently used as an apartment above and commercial space at the street has seen numerous changes over time that erode at the building’s historic integrity. The building currently has little of its original grandeur. Asphalt siding was added in the 1940’s; this obscures the original wood siding. And the alterations that have occurred over time could be peeled back to reveal its history; wood porches could be added to replicate the documented original structure. The building in its location and its overall form remain unchanged; this is its essence. As its name describes, the building was once both “grand” and “central”. The boxy 2 1/2 story large form sits right up to the sidewalk in the most urban way. Originally (now gone) a full attached second story porch was supported by four classic columns and created a covered front entry porch. The hipped roof form still sports small dormers on each side of the building. The soffit is a flat box soffit with medium overhangs. The upstairs has large 2-over-2 double hung windows. Original flat rustic drop siding with comer boards is still visible on the small dormers and at the sides and rear. “Issaquah Family Album: The Croston family”, March 21,1990.